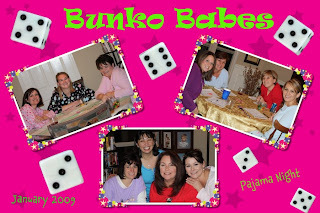 Our Neighborhood started a Bunko group in the fall and we played last night. Sometimes we have "themes" and last nights theme was Pajama Night! It was so nice to walk a few house down in your pj's, hang out with a fun group of ladies of all ages, and even enjoy some snacks and adult beverages too. I have enjoyed getting to know our neighbors and love me some "girl time!"